Unable to write Sam Dalmas is considering returning home to the U.S. after living in Rome with his girlfriend Julia for several years. While visiting an art gallery Sam sees a young woman get attacked by a strange man wearing black gloves and a rain coat. Sam attempts to thwart the attack but he gets trapped in an electric door and watches the strange man make his escape. Sam is haunted by what he saw that night, feeling sure that some vital clue is evading him, he decides to help Inspector Morosini (Enrico Maria Salerno) in his investigation. He interviews the pimp of a murdered prostitute and visits a shop where another of the murdered women worked. There, he finds that the last thing she sold on the day she was murdered was a painting of a stark landscape featuring a man in a raincoat murdering a young woman. He visits the artist, but finds only another dead end. As he makes his way back to his apartment, Julia is attacked by the same black-gloved figure, but Sam arrives home just in time to save her and the assailant escapes. Argento's signature Gialo style is apparent in this directorial debut. The horror films of this particular sub-genre are known for blending crime mysteries with over the top slasher gore and beautiful surrealistic imagery. Most of these films are built using dream logic that blurs the line between the natural and supernatural worlds. Argento was incredibly fortunate to have Vittorio Storaro shoot his first film. This is the man who went on to shoot films like APOCALYPSE NOW, THE LAST EMPEROR, REDS, and THE LAST TANGO IN PARIS. He was instrumental in helping to shape the visual style that Argento is known for. And while THE BIRD WITH THE CRYSTAL PLUMAGE is one of Storaro's early works it's clear that he would become one of the greats. The widescreen photography and brilliant primary color pallet are stunning. The alluring imagery raises the film to above genre status. 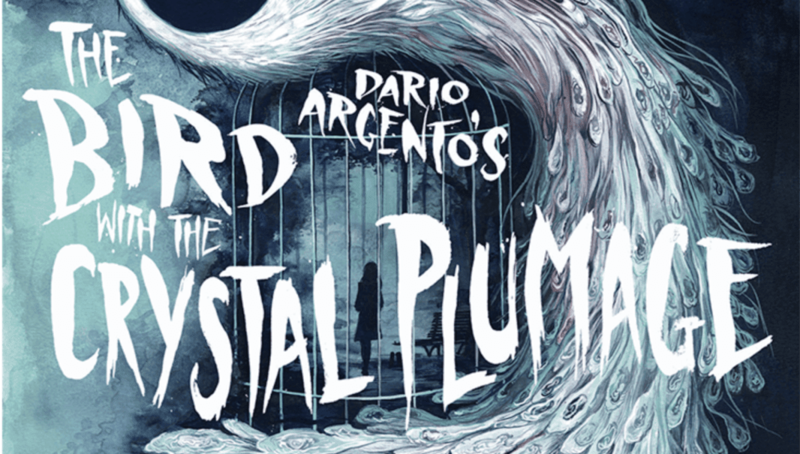 I've always felt like CRYSTAL PLUMAGE is Argento's Vertigo, a film that needs to be reexamined and considered among the classics. If you are a fan of 1970's horror I can't recommend this one enough. It's a great movie, from a legendary genre filmmaker, presented with reverence and care. In my humble option this is a must own. You can purchase Arrow's release of THE BIRD WITH THE CRYSTAL PLUMAGE here.